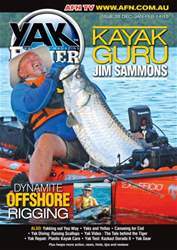 Issue 28 of Yak Fisher rolls into summer with variety a plenty. In the salt Jim Sammons talks TV, Tommie Strydom details rigging, Damian Bowman tells a tiger tale, and diver Pete Ritchie lifts a scallop bag to the surface. Getting fresh, Andrew McGovern canoes cod, Andy Bryant revisits Yea, and Robbie Waller examines yellow belly. Steven Joyce details plastic kayak care, the old sea dog the Kazkazi Dorado II gets reviewed, and for Yak Fisher garnish there’s State News and Yak Gear. The Yak Fisher summer is set to sizzle!